snowdeal.org > ex machina: pony boy sheet music? odin loves the song pony boy which is understandable since it's on one of his favorite cds, happy lemons, and we still sing a modified version we call pudding boy, pudding boy!. 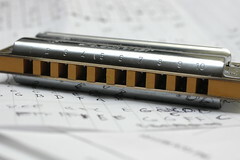 since i've a hankerin' to pick up the harmonica again and we have fun playing together, i thought it would be fun to get the sheet music for the song and transcribe the vocal parts/melody to harmonica. but i can't find a source for the sheet music anywhere and i'm not very good at picking out notes by ear so i'm not having very much luck. if you know the notes to the tune i think you could make odin's new year by leaving them in the comments or sending them to me in an email ( eric AT snowdeal DOT org ).